I’m in a strange place this week. Recuperating from NaNoWriMo, wrapping up a fall term of teaching and grading final exams, and warming up my design skills for my first run as Jersey Devil Press‘s new production editor. So this week, I’m digging into my huge stack of physical pen-and-paper notebooks and posting an old entry from years and years ago. A kind of retrospective Writer’s Notebook. Which, come to think of it, might be fun to do now and then, especially since so many of the things I’m planning to write in the coming months are intended for publication elsewhere. So maybe I’ll make this an occasional thing for the Notebook, a kind of series-within-a-series. Think of it as one of those episodes of long-running sitcoms where all the characters reminisce and then show a montage of old clips from past episodes. I wonder if I can add a laugh track to my posts. . . .
cut by the black defroster wires. ghost ship on seas of tar and stone. the sound of blood in transit. or a scratch on your retina. two feet ahead of the bumper. No breathing, no other headlights. No exercise to this, at least not one that I remember. I don’t recall exactly when I wrote this, either, though it’s on the front pages of one of the earliest notebooks I hung onto, so I’m guessing late winter or early spring of 1998? 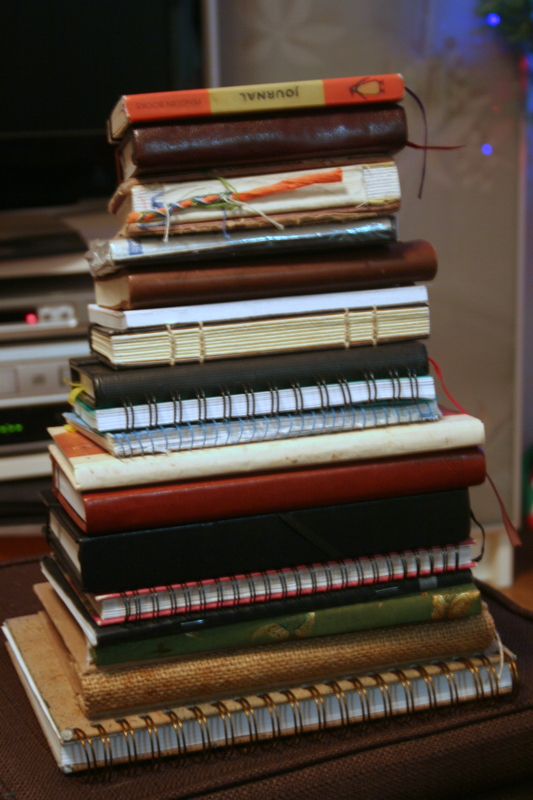 As I was looking through my old journals for something to post today, I decided to stack them up and count them, too. 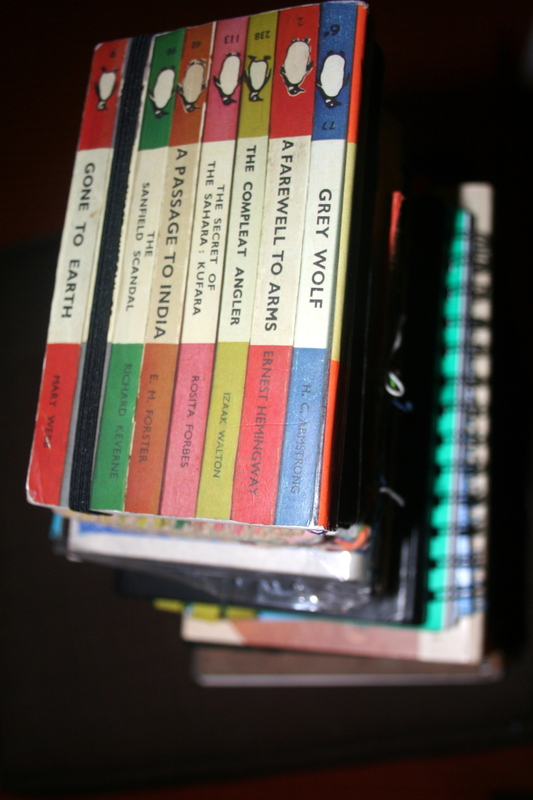 Sadly, I’m missing a handful — at least three of those old composition notebooks and two old spiral notebooks that I can think of off hand — but in this stack (at left), I have nineteen that I’ve kept. Not all are full, though. Some are special purpose journals: I have a journal I only write in on long trips away from my wife, a journal I only write in when we visit Canada, a journal I started my Scotland writing in and have decided to keep free for similar trips later, a journal my wife gave me for our one-year anniversary that I designated as only for sappy love poems. Two of these are my current journals, one for teaching and classroom notes and the other for my personal writing. One of these I didn’t include in the stack because it contains notes from the Buddhist teachings I’ve attended, and another is completely blank because I haven’t got round to it yet. But at least two-thirds of these notebooks are completely filled, front to back, with scribblings, sketches, maps, notes, poems, stories, funny words, cool quotes, ideas for titles, character names, and anything else I can think of. Yes, even a few packing lists for long trips. This journal — the one I took this attempt at a poem from — was a gift from my wife; she bought it for me in San Miguel de Allende, Mexico. It was hand stitched from old notebook paper and recycled corrugated cardboard; she bought it in a little street market, and for years it smelled of jasmine incense. It’s a thick notebook that never quite fit in any of my pockets, but I carried it around everywhere for more than a year, and even now I enjoy flipping through it. It feels good in my hands. The texture of the corrugations, the flaking paint on the cover like patina on a sculpture, the thick bookmark of braided orange-and-purple threads — these things delight me, make me want to write new things in new notebooks. I’ve become rather addicted to the idea that my best writing is my typed writing, that I have to be at a keyboard in order to keep up with my thoughts. 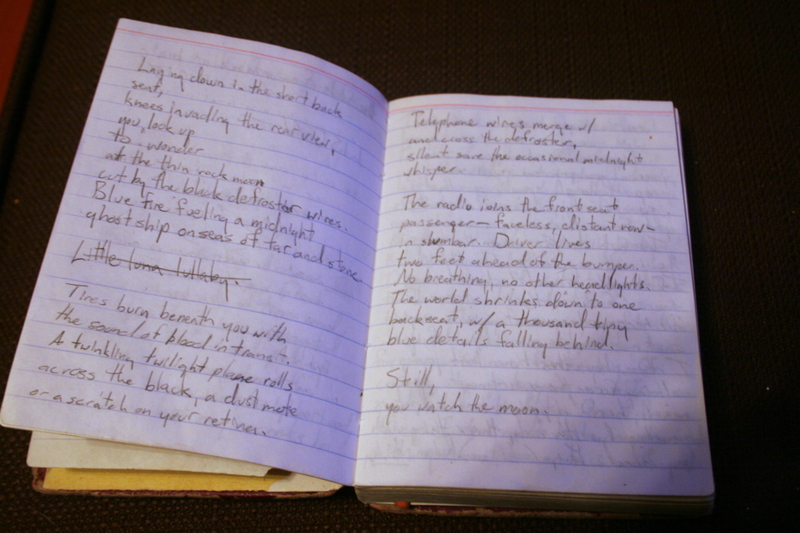 But there’s a lot to be said for the physicality of handwriting in a hand-made notebook. I need to do that more often. I intend to do that more often.